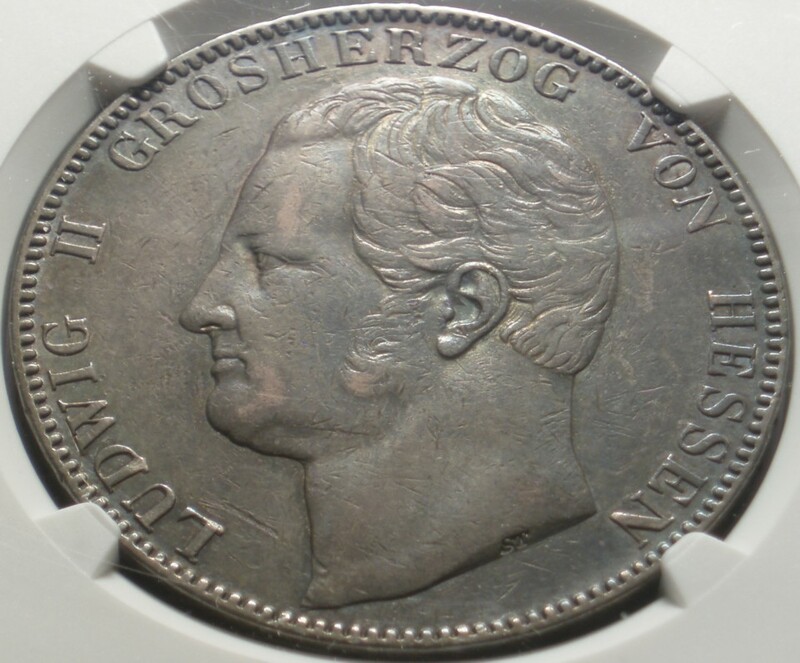 Very scarce 1840 “Two Thalers” from the “Grand Duchy” of Hesse-Darmstadt in Germany. It has been certified genuine and graded Extremely Fine 40 by the prestigious third party grading service, “Numismatic Guaranty Corporation” (NGC). 37.12 Grams, .900 Silver. Mintage: 367,600. As a comparison, the famous 1909-S V.D.B. Lincoln Cent had a mintage of 484,000 pieces. “Standard Catalog of World Coins” (1801-1900) by Krause-Mishler. #310. Obverse: LUDWIG II GROSHERZOG VON HESSEN • Ludwig or Louis II. Ludwig II became Grand Duke of Hesse-Darmstadt upon the death of his father Ludwig I in 1830. His reign came to an end during the “Revolutions of 1848” when he abdicated to his son Ludwig III. Reverse: 3½ GULDEN • 2 THALER • VII EINE FEINE MARK • VEREINS • MÜNZE • 1840 • Oak wreath. This coin only saw a few hands before it got put away. Not many of these survived all the intervening melting pots. One of the earliest attempts to standardize the coinage of Europe led to the “Munich Coin Treaty” of 1837 and then the “Dresden Coinage Convention” of 1838, both of which Hesse-Darmstadt agreed to. It set standard values and cemented the relationship between the Thaler and the Gulden in most of the numerous “German States.” This coin has edge lettering stating that it adheres to the convention.